Gam will be posting about the Greyhound next! Why post about pubs that have been shut for yonks? Ooh; sorry. But if it's so completely irrelevant, why were you looking at it?! Just saying it needs to be labelled as CLOSED on here but don't know the process for doing that - if you're that keen for people never to post about pubs posthumously, perhaps you could do the necessary?! Pub is closed for about 16 months now, as mentioned on here. Why post about it? Hear hear Geoff! 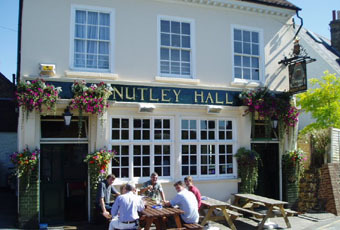 I haven't passed by the ex-Nutley for a while now but I almost daren't do it, in case what I find has happened to the charming exterior is nothing short of vandalism. I was told the frontage had a listing of sorts, so fingers-crossed. The pub should be indicated as closed by site moderators but I don't know how one goes about getting that done.